This Myanmar family tour is tailor-made for families with younger kids who want to explore as much of the country as possible, while keeping a slower pace and variety of activities to keep the kids (and parents!) entertained throughout the holiday. After exploring all the must-sees of Myanmar, this family tour ends with relaxation time in Ngpali Beach. As with all of our tours, this itinerary can be tailored to suit your requirements – one more or less day here and there, more free time, different sightseeing options, different accommodations, etc. Families with younger or older kids. For families who are more active and want to include some trekking, biking, kayaking and other activities please refer to our Mynmar Active Adventure Tour and let us suggest how we can customize your Mynamar family holiday! Welcome to Yangon! Upon arrival meet your local guide and transfer to your hotel. Rest of the day is free at leisure, or depending on your flight time, we can suggest some activities. Today you will delve in to Myanmar’s culture with a full day excursion around Yangon. Set off with your local guide and transfer to Yangon’s Central Station where you will board the “Circular Train”. This slow-moving train is used as a commuter train by main locals as it circles the outskirts of the city and stops in dozens of neighbourhoods. As you travel around, enjoy the buzz on board as vendors hop on and off and look out the windows to get a clear overview of the city (train ride is about 20 minutes, please take note that the trains are very simple, and used by many locals during the day). Disembark in the suburbs and visit the bustling market where locals come to buy colorful fruits, fresh vegetables and chat with the friendly vendors. Transfer back to town and free time to relax before your afternoon excursion. This afternoon we will use another local transportation method to explore Dhala, a small village on the opposite bank of the Yangon River. A multi-level ferry shuttles locals back and forth between the village and the city and we’ll join them for the 15 minute journey across the water. It’s a fascinating way to see the contrast between the modern city and local suburbs. Upon reaching Dhala travel by trishaw through the side streets, stopping to meet with friendly locals or explore the monasteries and markets in the area. Return via ferry to Yangon in the late afternoon and transfer to your hotel. Head to Kandawgyi Park, a favorite place for local families to gather to play or relax after work or on the weekends. It’s beautiful lake and views of Shwedagon Pagoda make it an ideal place for a picnic. Arrive as the sun is setting, casting its rays on an illuminated Shwedagon Pagoda, and head to your picnic location where a mat and food has been laid out. Snack on delicious dishes, enjoy a glass of local beer or wine from one of the country’s vineyards and interact with the local families. It’s an early start this morning as you transfer to the airport for a flight north to Bagan. Bagan was one of the greatest cities in Myanmar from the 9th to 13th centuries and more than 2000 brick monuments were built, most of which remain standing today. It is truly a remarkable place. Upon arrival you will be greeted at the airport and transferred to you hotel for check in. Upon landing, we’ll start exploring the temples, villages and riverside of Bagan. Start with an elevated temple where you can climb atop to see panoramic views of the Bagan plains. 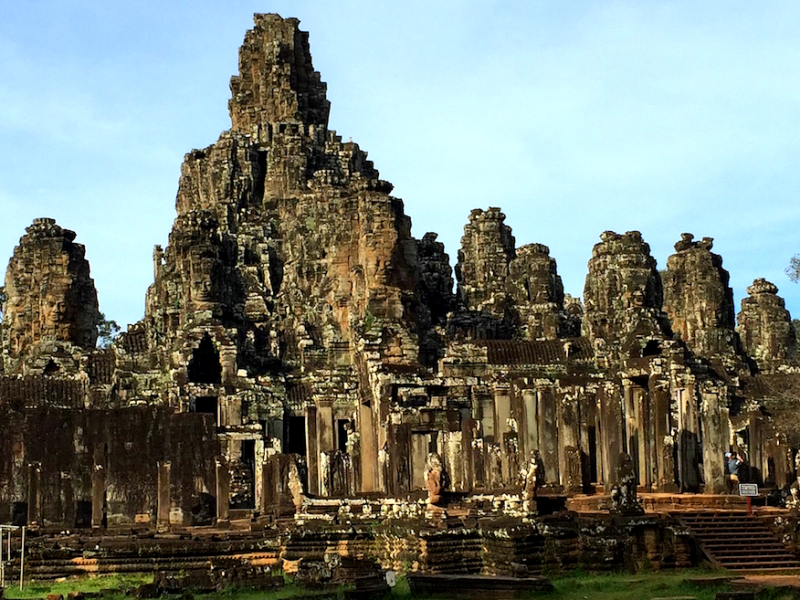 This viewpoint will give you a taste of the sheer number of temples as well as some of their distinctive styles. Continue to various other temples dotted around the temple plains, including highlights such as Ananda and Shwesandaw, to experience a variety of architectural styles and artistic wonder of a bygone era. Traveling amid the temples you will get a taste of rural Bagan life in this ‘living museum’ setting where farmers and families work amongst the monuments. After a short siesta back at your hotel, you will board a private river boat and set off upriver on a sunset cruise. Sitting either under the shade or on the open-deck you’ll be treated to fabulous views as you cruise down the Irrawaddy River. 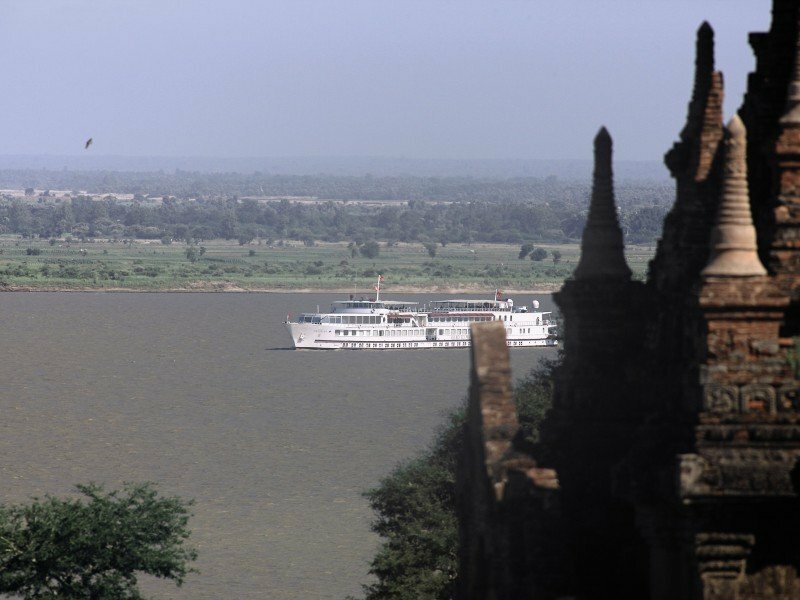 The views of Bagan from the river are particularly spectacular and offer a different perspective from the land based tours. As the sun begins to sink slowly from view, stop at a sandbank where you will learn how to play the cane ball, a popular local sport with families. Enjoy a game with locals and your family before re-joining your boat and cruising back to Bagan. From the jetty, transfer back to you hotel for the evening. Transfer to a local home for a Myanmar traditional cooking experience. Your friendly host will great you and explain her market finds of the day, and if you’re in luck, some seasonal vegetables native to Bagan region will be on the menu. Share cooking methods, stories and some laughs as you prepare your lunch. After 1:30 – 2 hours of cooking, it’s time to enjoy the meal together in the home garden. In the late afternoon, you will continue your journey by horse cart for an excursion that passes Thatbyinnyu, the tallest temple in Bagan, gigantic Dhammayangyi Temple noted for its remarkable brickwork, and of course, Sulamani Temple. Cap off the day watching the sun set from an elevated pagoda. After breakfast we set off on the scenic drive to Mount Popa (50 km, 1.5 hours). The local people believe Mount Popa is home to the nats, 37 spirits worshiped by the Burmese, and thus it is a popular pilgrimage site. As you drive away from Bagan you will pass through a flat, dry zone- one of the driest areas of the country- before starting to ascend in to the hills. Mount Popa is actually an extinct volcano rising more than 1500 meters in elevation. As you approach, in the distance you will see ‘Taung Kalat’, the sharp volcanic plug believed to be the nats home. Depending on the time, you may head to your hotel first for check in and to enjoy the views over the temple plain. Then head to the base of Taung Kalat where 777 steps take you to the top. You’ll be joined by local families and other worshipers who come to pay homage to the nats– as well as a few cheeky monkeys who live at Popa. Although the final climb to Popa’s summit is optional, it is strongly recommended as the views over the Myingyan Plain are truly magnificent. Return to your hotel in the late afternoon and enjoy the fresh air, spring-fed swimming pool and tranquil setting of the resort. This morning is free at your leisure. You may wish to take a short walk through the surrounding forest, particularly if you are a bird-watcher, or enjoy additional time at the swimming pool. Return to Bagan this afternoon. On the way back, stop in the countryside at a toddy farm. Here you will see the local farmers at work harvesting the juice from the toddy trees and then processing it in to various forms such as alcohol, sugar and molasses. Continue to Bagan and check in to your hotel. Rest of the day is free at leisure. A short domestic flight in the mornign takes you in to the Shan hills and the town of Heho. Transfer by road through the winding hills to the village of Magwe, around 25 kilometres from Kalaw (2 hours total drive time). Arrive at the Green Hill Valley Elephant Project, a ‘retirement’ home for logging elephants whose aim is to protect local ecology, elephants and traditions of the regions’ people. The activities for visitors are intended to expose the natural beauty of the area as well as the explain the importance of elephants and their mahouts in Myanmar. You’ll be greeted by the local team at the camp rest house and, while having a refreshing drink, will be given a briefing on the camp’s background and activities. From here it is a short (5-10 minutes) walk to the river where the elephants may be bathing or foraging for food. Encountering these animals in their natural environment is a truly special treat. You will then have the opportunity to climb on the back of an elephant and explore the forest. The indigenous flora and fauna includes dozens of bird species, butterflies and a variety of orchids. Enjoy lunch of locally-grown produce and then visit the re-forestation project where, if you wish, you can get your hands dirty and plant a sapling. After saying goodbye to your hosts at Green Hill Valley, drive to Kalaw (1 hour) in the late afternoon and transfer to your hotel for check-in. If you like a bit of adventure, there is an option to travel by local train from Kalaw – Heho (2-3 hours) The train route is very scenic, passing through mountains and farm fields and it will also offer further insight into local life. You will hardly see any other tourists on this train! This morning take a scenic drive (92km – 02:30 hours) to Nyaung Shwe, the gateway village to Inle Lake. Along the way, if you wish, stop in to see rural workshops that specialize in traditional Shan paper and unique handcrafted umbrellas. From Nyaung Shwe you will board a private motorboat and go to Inle Lake, one of Myanmar’s most spectacular and breathtaking sights. Its calm waters are dotted with floating vegetation and fishing canoes, to which scenic hills provide the perfect backdrop. Observe the daily activities of the local leg-rowing fishermen and see their ‘floating gardens’, which are built up from strips of water hyacinth, earth and anchored to the bottom of the lake with bamboo poles. Visit Phaung Daw Oo Pagoda, which contains five sacred images of Buddha decorated in gold leaf. There are also many traditional crafts originating on Inle Lake and, should you wish, we can stop for a visit to one making incredible woven items from lotus silk, boat builders (depending on the time of year), a cigar making workshop, blacksmiths or even silver smiths. After lunch, a 1-hour boat ride down a small canal will take you to the Pa-Oh village of Indein, positioned on the western shores of Inle Lake. Take a leisurely stroll around the village before ascending the moss-covered stairway to the top of a hill. Once you’ve arrived at the summit, you will be greeted buy an iconic Buddha image which sits enshrined among hundreds of stupa ruins and overgrown shrubbery. Then it’s time to embark on a 45 minutes trek to Sae Ma village. Along the way, you’ll enjoy the natural beauty and panoramic vistas of the area while basking under the shade of the bamboo grooves in the area. Upon arrival at the village, observe the daily lifestyles of the rural inhabitants. On your boat ride back, should time allow, stop at the Inthar Heritage House to learn more about the history and culture of the lake’s indigenous people and enjoy a delicious coffee and cake. As an exciting day comes to close transfer back to your hotel for some well-deserved relaxation. Free at leisure until transfer back to Heho airport for a direct flight to Thandawe. Upon arrival transfer (20-30 min) to Ngpali Beach. Depending on how much time you have, the rest of your family holiday is spent relaxing at the beach. You can chill out on the white beach and swim in the crystal waters, or ride a bike to the nearest village and stroll through the alleys while watching the lively and colorful local life flowing and fishermen placidly coming back from their fishing trips. If you want to explore the marine life a little further, join a boat trip and snorkel or dive close to one of the many islands off the coast. You’ll be overwhelmed by the bright and shiny colors of underwater life. Free at leisure until transfer back to Thandwe airport for a direct flight to Yangon where you will connect to your departure flight.